Self-Service Technologies (SSTs) enable consumers to produce services independent of direct employee involvement. The successful introduction of SSTs into healthcare and the realisation of their benefits will however lie in their acceptance by patients. 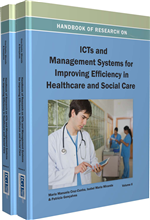 This chapter outlines the advantages and disadvantages of one type of SST, namely self-service hospital kiosks, and presents results of an empirical study carried out on the willingness of patients to use them. Data was collected from 192 patients attending two private healthcare clinics in Johannesburg, South Africa. Results show that patients are most willing to use kiosk technologies for administrative rather than diagnostic or treatment-related services. Moreover, the authors find that technology anxiety, self-efficacy beliefs, trust, and need for interaction are important antecedents to the formulation of performance and effort expectancies and the willingness of patients to use kiosk technology. Results have implications for healthcare providers looking to improve the success of their SST applications. Information technologies are recognized as an essential component of health system reform and are increasingly being embedded into strategies for a sustainable, accessible, and high quality health system (Tsiknakis & Kouroubali, 2009). While a good deal of effort has been focused on understanding the adoption and impacts of clinician-oriented IT applications (e.g. Kaplan, 2001; Kaushal, Shojania & Bates, 2003; Poissant, Pereira, Tamblyn & Kawasumi, 2005; Prgomet, Georgiou & Westbrook, 2009) and the reaction of healthcare workers to IT inducted change (Ayatollahi, Bath & Goodcare, 2009; Timmons, 2003), patient readiness for an increasingly IT-enabled healthcare system has received less attention. Yet, technology can enable patients to independently produce healthcare services and these may hold much promise. Self-Service Technologies (SSTs) have permeated numerous sectors of the economy. They are now common place in the banking, retail, hotel and airline industries and are enabling consumers to produce services independent of direct employee involvement. Hoping to capture the benefits experienced in those other sectors, both public and private healthcare facilities are increasingly adding these technologies to their IT portfolios. Among these is the self-service hospital kiosk. These technologies hold much promise for improving hospital efficiency and service delivery and for improving patient outcomes. However, their successful introduction into healthcare and the realisation of their benefits will lie in their acceptance and use by patients. If health consumers begin to engage with these technologies in a meaningful way, they have the potential to transform the healthcare experience (Warren et al., 2010). Yet, if patients are unable or unwilling to use these innovations they will fail to bring much needed improvements to health service delivery. We see this as a research problem in need of investigation. The purpose of this chapter therefore is to understand patient readiness and willingness to use self-service kiosks within the healthcare process. The chapter first outlines the functionality of self-service kiosks in healthcare, and their advantages and disadvantages are discussed. Next, we present the empirical research study that we undertook to improve our understanding of patients’ willingness to use these technologies. The chapter concludes with recommendations for healthcare and technology providers along with directions for future research. Technology anxiety: An affective, emotional response arising from the use of (or the thought of using) technology. Health Consumer: (Also healthcare consumer) An individual who uses the services of a healthcare provider including patients receiving medical care or treatment. Performance Expectancy: A belief that the use of a particular technology will be advantageous or performance enhancing to the individual. Effort Expectancy: A belief that the use of a particular technology will be easy and effortless. Self-Efficacy: A self-judgement of one’s own capability to perform. Health Provider: (Also healthcare provider or health service provider) Typically refers to an organisation such as a medical facility or hospital but also refers to individual healthcare workers. Consumer Health IT: Those information technologies that support or enable health consumers to access healthcare services and actively participate in and control their healthcare process. Need for Interaction: An individual’s context-dependent desire to interact with other people (typically service employees) rather than with technology. Trust in Service Provider: An individual’s belief in the competence, reliability and benevolence of a service provider. Self-Service Technology: Technologies that allow patients to produce services independent of front line employee assistance. They can be deployed online or offered through dedicated kiosks.